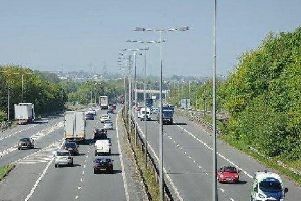 Traffic built up on the M6 near Preston following a collision involving a minibus and a car this afternoon. The smash happened at the junction of the southbound M6 and M61 just before the evening rush hour. It is thought a taxi minibus and a car were involved. Police and ambulance were at the scene and it is believed at least one person was injured. One lane of the motorway was blocked and queues formed up the M6 as far back at the M55 junction at Broughton as emergency services dealt with the incident. There were also delays on the northbound M61 approaching the junction.